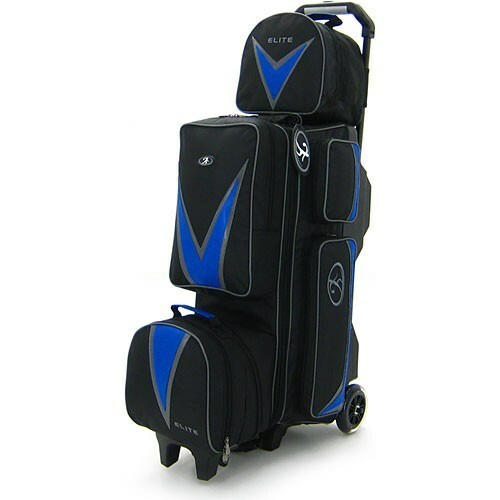 This roller bag from Elite gives you the option to carry 3, 4, or even 5 bowling balls as well as shoes and accessories. With that many options how could you need another bag? This is a great bag for taking more than 3 balls back and forth to the bowling alley. My husband loved it. I didn't like the bag because tips over easily because the way the one ball is situated on top. The single ball bag that attaches to the top is hard to attach because of the way it zips. The bag for your shoes is Velcro and after a little time the bag will adhere but, not as well. Also there's a clip that's suppose the keep the shoe bag in place, but it's very flimsy. I will not purchase an elite bag ever again, and I hope who ever reads this I have helped you save money. I've had it for 7yrs before the handle broke. But I got good use out of it, that's why I'm ordering another one. Everything fits well and to me it's a heavy duty bag. By Mikey from Des Moines, Iowa. Able to carry 5 bowling balls. what is the elite protections include. We offer a platinum protection offer for $9.95 and you may see more information about what this includes by clicking the details button just below the price out beside this option above. Hello Peg, Any order placed after 2pm (Central time) will ship out the next morning. All orders take 3-5 business days to ship. will this bag have a ball restraining mechanism in place, so that the balls won't roll free? Does all ball & shoe compartment have zipper close on them and other pockets for towel and other things to be stored. This bag will include the bags pictured necessary for this bag to hold up to 5 bowling balls. How many balls does the bag hold? This bag can store up to 5 bowling balls. Only one bag will detach from this bag. Do the wheels on the 3 ball bag light up? Unfortunately, the wheels on this bag do not light up. How do the bags attach to the frame? The bags are sewn onto the frame. The only colors that it comes in is the color that is advertised. I'm sure that the extra accessory pockets would be able to fit two pairs of shoes, but it is usually only meant to store one pair of shoes. Is there a time frame when this bag will be back in stock? This roller will be back in stock until mid May of 2019. When will this be back in stock for ordering? This will be back in stock around mid May of 2019. This looks to be back in May later this year. Unfortunately, the third ball bag is not sold separately. Due to the time it takes to produce the Elite Deluxe 3-4-5 Option Roller Blue/Black ball it will ship in immediately. We cannot ship this ball outside the United States.